Here's a quick way to make this dish without sacrificing the flavor! As a mom, you only want what's best for your little one, in all aspects. When it comes to his meals, you want to make sure he eats delicious and healthy food. But sometimes it can feel like you don't have much time to prepare all the best things for your child. You don't really have to go through a great deal of preparation, especially in the kitchen. All it truly takes is a set of reliable, high-quality ingredients that will make every dish you prepare special and delicious, and simply good for the family. 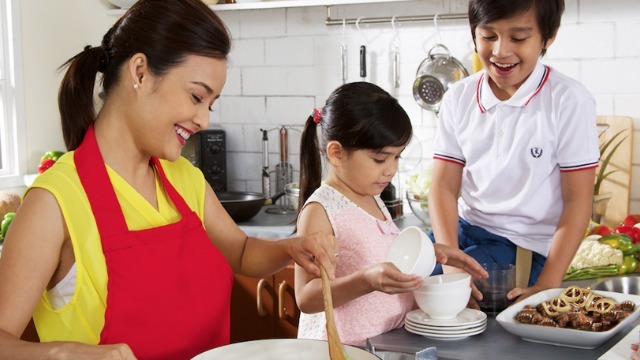 You can also make use of your imagination so you can come up with creative twists to usual Filipino classic recipes. You can also consider using new ingredients that will definitely allow you to serve tastier meals everyday! Try out this classic Pinoy Bistek with this new secret ingredient! You'll be surprised with what a little change can do to your simple recipes. 1 Sauté onion in 2 tablespoons of vegetable oil until light golden brown. Set aside. 2 Season sirloin with MAGGI MAGIC SARAP® and pepper. 3 Sear sirloin until golden brown and set aside. 4 Add oil and sauté garlic on the same pan. 5 Add seared beef, MAGGI® SOY SAUCE, and sugar. 6 Barely cover with water and simmer until tender. Once tender, let the sauce reduce. 7 Add calamansi juice. Serve. PRO TIP! Serve with rice, and if your kids are feeling a little adventurous, add small rings of white onion on top while the meat is simmering. Marinating the pork overnight in MAGGI® Soy Sauce gives your dish a unique malinamnam flavor, with a blend of saltiness and a hint of sweetness, it's a great way to enhance home-cooked meals. A tip for moms while grocery shopping is to turn your soy sauce upside down - you'll see that MAGGI® Soy Sauce is latak-less, meaning there's no residue at the bottom! It is made with select soya beans that go through a natural fermentation process for months. The resulting flavor would definitely turn the ordinary meals you prepare into delightful specialties that your family will love. Check out more recipes on maggi.ph and try them out with the NEW MAGGI® Soy Sauce! Share your dishes online using #ItsSoyDelish, and follow MAGGI on Facebook at /maggiphilippines or Twitter at @MaggiPhil!